This test evaluates the body's (and especially the heart’s) response to exercise. The heart rate, blood pressure, and electrocardiogram (electrical activity of the heart) will be recorded during a program that increases the difficulty of exercise every few minutes. The level of initial difficulty of exercise will be set by the patient's age, height, weight and gender. 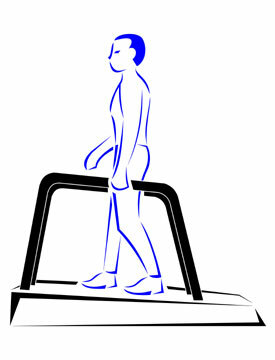 The exercise may be on a special stationary bicycle or on a treadmill. The patient will be encouraged to give their very best effort. The test will be stopped when the patient has reached maximal effort and can go no further. In order to produce the electrocardiogram (ECG), a number of electrodes (usually 12) are placed on the skin of the patient's chest and limbs with adhesive patches. Numerous electrodes are necessary in order to give a complete view of the heart’s activity. The skin will be cleansed and possibly shaved at the points of electrode attachment to insure a high level of contact. An electrocardiogram does not hurt, although young children may find the process scary. No electricity is transmitted through the body.